There are currently 981 World Heritage Sites worldwide. To be considered one it has to have ‘outstanding universal value’ and falls into the following sites: cultural, natural and mixed. A World Heritage Site could range from being a building, a mountain, a lake to a desert, monument, forest and even a city. Here are just a few of the most iconic World Heritage Sites of them all and the best places to stay so you are right in the thick of the action! 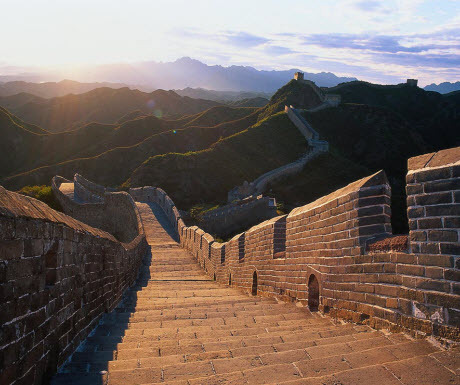 An amazing feat dating back to the 5th century and spanning many centuries to build, The Great Wall is 13,170 miles long, making it the longest structure in the world. Initially built as a defense against enemies, the Great Wall of China stands today as a major tourist attraction for visitors worldwide. It has been a UNESCO World Heritage Site since 1987. Fairmont Beijing, an award-winning hotel located in the thriving business district. 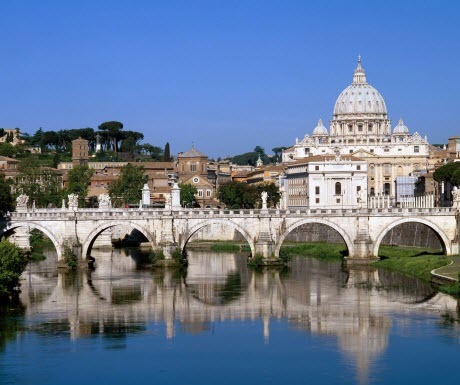 A city within a city, Vatican City is a state in Rome with a population of around 840. With an area of just 110 acres, Vatican City was established as an independent state in 1929. Ruled by the Pope, the city features cultural sites such as the Sistine Chapel, the Vatican Museums and St. Peter’s Basilica. Portrait Roma Hotel, centrally located hotel also offers amazing rooftop views. One of the most remote inhabited islands in the world, Easter Island has an air of mystery and intrigue surrounding it. 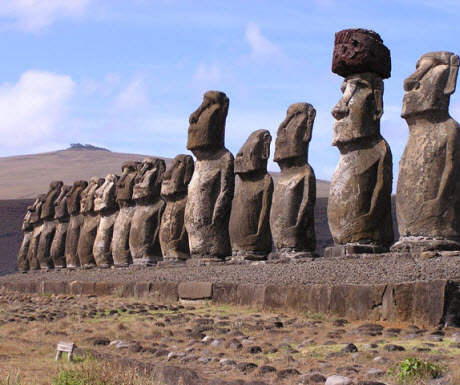 There are 887 monumental statues on the island named Moai and its existent has never been fully explained. Moai were carved out by the Rapa Nui people between 1250 and 1500, with the tallest standing at an impressive 10 meters and weighing 82 tons! Posada de Mike Rapu, an aesthetically pleasing modern hotel on Easter Island. 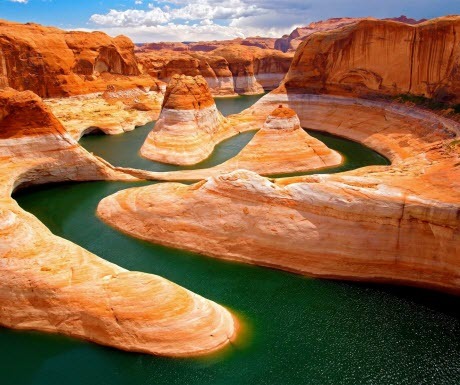 Over 18 miles wide and stretching over 277 miles, the Grand Canyon is one of the world’s natural wonders. From helicopter rides, scenic drives or hikes across the canyon, the landscape of the Grand Canyon ranges from different textures and colours. Amangiri, set in stunning desert scenery with plateaus and canyons. 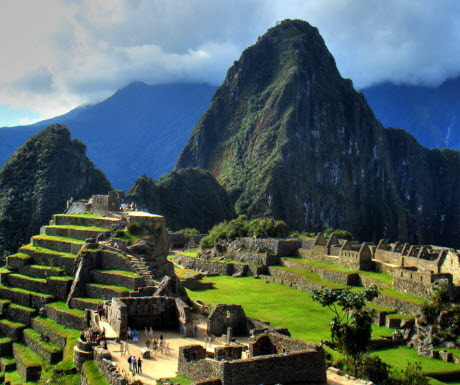 Machu Picchu is the ruins of what was once home to the powerful Inca Empire. The cultural site was bought to the attention to the world by explorer Hiram Bingham and is widely known as the ‘Lost City of the Incas’. Shrouded in mystery, Machu Picchu is Peru’s most visited attractions. Set high up in the mountains, visitors can reach the site on a rewarding Inca Trail through tunnels, jungle and cloud forest along the way. Belmond Sanctuary Lodge, the only hotel at Machu Picchu. 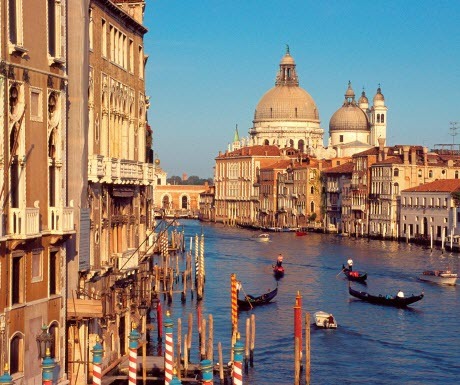 Venice is the city on water built upon 118 tiny islands and unlike any other city in the world. The canals of Venice run throughout the city and locals and visitors alike can travel via the many foot bridges and boat canals. The Gritti Palace, for amazing views of the Grand Canal. 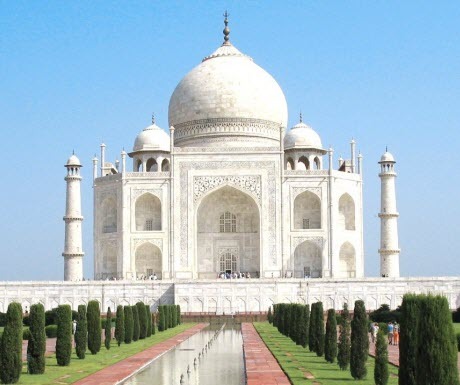 Built as an everlasting symbol of love, the Taj Mahal was built using white marble and stands as a mausoleum to Emperor Shah Jahan’s third and favourite wife. It took 16 years to finish and the surrounding garden an additional 5 years later. The architecture of the Taj Mahal has been inspired by a collective mix of Indian, Persian, Islamic, Turkish and Ottoman influences. The outcome of the Taj Mahal is a perfectly symmetrical piece of architecture except in one instance, which is where the emperor’s tomb is. The Oberoi Amarvilas Agra, which overlooks the Taj Mahal. 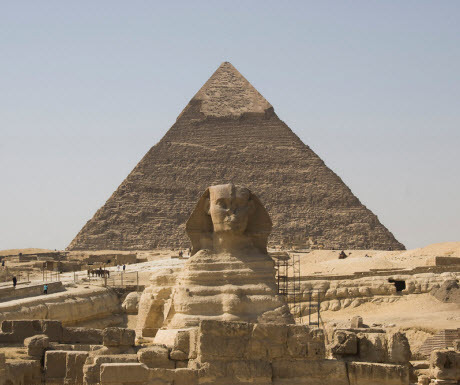 Instantly recognisable anywhere in the world, the Pyramids along with the Great Sphinx of Giza and other monuments have stood the test of time. Built around 2584BC, the Pyramids of Giza have remained mostly intact, in particular the Great Pyramid, the largest of the three. Four Seasons Hotel Cairo, with views of the Pyramids. 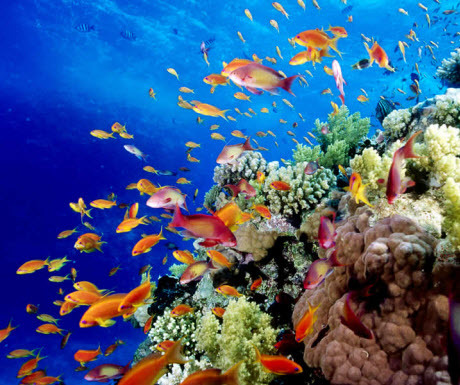 A whole world of its own, the Great Barrier Reef is the world’s largest coral reef system. Spanning 900 islands over 1,400 miles, the Great Barrier Reef can even be seen from outer space! There is diverse marine life ranging from various species of whales, dolphins, turtles to 1,500 types of fish, crocodiles, sharks, stingrays and much more. Bedarra, a secluded tropical haven in the heart of the Great Barrier Reef. 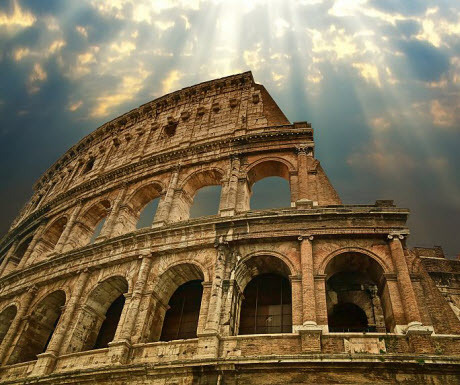 Dating back over 2,000 years ago, the Colosseum signifies one of the Roman’s architectural achievements. Set in Rome, The Colosseum and the Roman Forum represent two pivotal symbols of Roman existence. The Colosseum was the place for entertaining the masses and also shows the structural strengths of Roman architecture. The Roman Forum is another significant building and was the centre of Roman life, a place for meetings, celebrations, public trials and matches. The Corner Townhouse, set in a luxurious and spacious 20th century villa. Louise Cheng is Marketing Manager at Holidays Please. Visitors to Florence don’t usually see its true architectural legacy as they wander the cobbled streets. That’s because so much of the city’s artistry and opulence remain discrete; tucked-away like long-held secrets behind unadorned walls of stucco and stone. Even a treasure like the Four Seasons Hotel Firenze blends so faultlessly with adjacent structures that you might walk right past without even noticing it. Only upon entering the soaring frescoed courtyard do you realize you’ve arrived somewhere absolutely extraordinary. 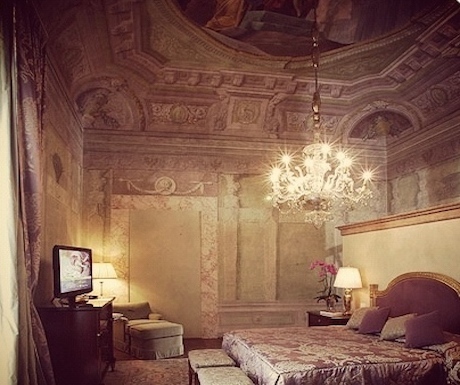 Dating to the fifteenth century as the Palazzo della Gherardesca, the historic portion of this visually stunning property includes a 116-room palazzo, its surrounding 11-acre landscaped garden, and a sixteenth century convent now transformed into a 36-room guesthouse and meeting space. 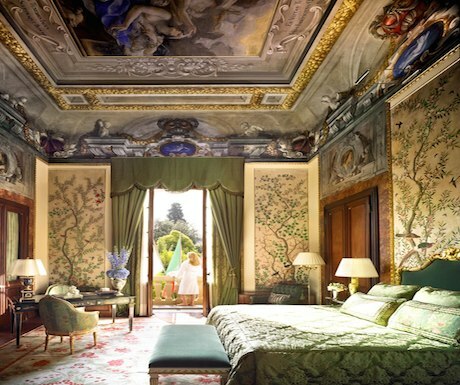 Opened in 2008 after seven years and untold millions in restoration, the Four Seasons Hotel Firenze could rival any small museum in its abundance of original frescoes, bas-reliefs, oil paintings, antiquities, and exquisite architectural details. A short stroll through the hotel and grounds reveals a seamless intermingling of art history and modern luxury that is so characteristic of this hotel group’s collaboration with designer extraordinaire, Pierre-Yves Rochon. Throughout, one sees bountiful use of luxuriant materials and fresh flowers. Fabrics are lush, seating plush, colors lustrous, and spaces vaulted and vast. Yet, amidst all the grandeur, a sense of comfort and warmth prevails. Multi-lingual staff is relaxed and friendly. In the dining room, servers seem to read minds with uncanny accuracy. 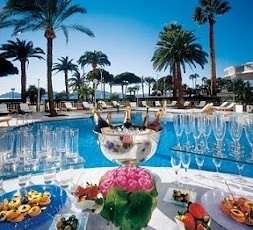 Savvy concierges faithfully curate guests’ most idiosyncratic wishes. And, as at all Four Seasons properties I’ve stayed, thoughtful amenities and state of the art technologies are impeccably woven into the mix. 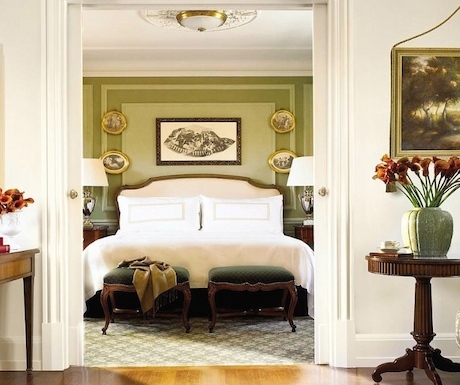 The eleven sumptuous suite styles would impress even a Medici. Many are resplendent with gem-toned upholstery, precious antiques, glistening Murano glass chandeliers, tall arched windows, and original frescoes harkening to a period when the Medicis actually did own Palazzo della Gherardesca. Bathrooms are scaled for giants, often with decadently deep, freestanding tubs beneath crystal chandeliers. Simply touring these suites left me with a raging case of bath envy from which I may never recover. Of course, the “regular” bathrooms are nothing short of fabulous either, thanks to their roomy dimensions and divine cabinetry. And even the smallest guestrooms are oversized (approximately 39 m2), decorated in gracefully traditional motifs. Neutral colors accented by soft shades of yellow or green are a perfect compliment to most rooms’ views of the verdant botanical gardens. And, oh, such gardens they are! This peaceful sweet-scented oasis, which doubles as an open-air gallery, would be reason enough to stay here if there weren’t already dozens more. Sculptures by renowned contemporary artists are placed along the park’s winding paths amidst fountains, ponds, follies, and an assortment of rare vegetation. I found myself returning often to the gardens even in the dead of winter, mesmerized by the array of painstakingly chosen, emotionally rich works of art. 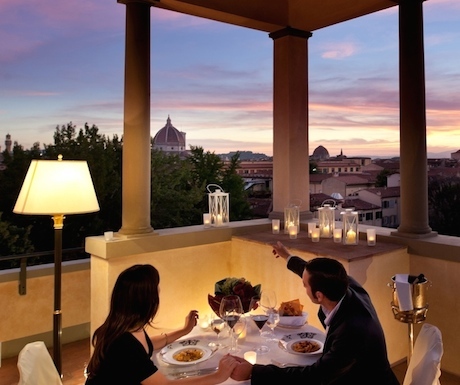 The Four Seasons hotel group is dedicated to designing unique custom guest experiences, and Florence is an ideal place to sample some of their best ideas. 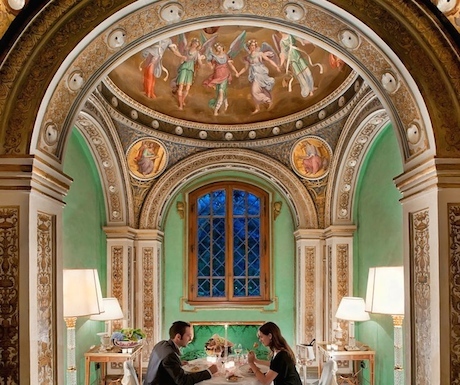 For couples with romance in mind, intimate dinners can be arranged at two of the palazzo’s most breathtaking spots: the gilded and frescoed former chapel, and the itty bitty roof terrace with staggering 360-degree views of the city, where you’re sure to have a singular “oh my!” moment. For families with young children, there are “kids visits” to museums and Pinocchio Park. And, especially for Dan Brown fans, the hotel has created an “Inferno Tour.” As if following in Professor Robert Langdon’s footsteps, guests view the Renaissance art and architecture central to “Inferno’s” mystery. Even “everyday” experiences at this hotel are distinctive. If private dining isn’t to your taste, the gorgeous Il Palagio restaurant will easily feed cravings for romantic elegance. Chef Vito Mollica’s fresh artisanal cuisine has earned Il Palagio a place among the surprisingly small group of Florentine restaurants to attain a Michelin star. Just as importantly, his menu promises to dazzle even the most discerning of locavores. On the casual side, the Atrium Bar is your airy, all-day meeting place for light bites, cocktails, or afternoon tea. At night, I highly recommend a plate of pasta, a glass of Tuscan wine, and a double serving of glamorous people watching, as the Atrium is a hot spot among fashionable Florentines, too. 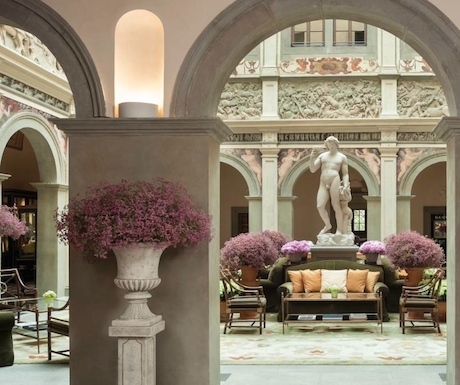 Four Seasons Hotel Firenze is located slightly outside the museum cluster in a charming residential section that offers welcome relief from tourist-clogged streets. Yet, you’re just a brisk 10-minute walk to Il Duomo. And when your soles demand a break from the cobblestones, a dedicated hotel shuttle will transport you in comfort, morning to evening. 19 Most Charming Places On Earth. Hidden all over the world are towns that you may think only exist in your dreams. They are villages full of quintessential charm, almost too perfect to be real. However, these dream towns, they do exist. Here are 19 towns that are so beautiful, you will scarcely believe that they aren’t movie sets. I wish I could see each and every one before I exit this mortal coil. Each of these places are going on my bucket list. Flickr / *Lie … on & off … ! The people who live in these places must be so happy, surrounded by such charm and beauty. If you’d like to show others these charming towns,click on the buttons below to share this story. Coastal Vacations is the type of company that will take you to the exotic locations and destinations that you would only dream about. If you are an adventurer, this is the way to go. With so many destinations to choose from, your vacations are limitless. This is a company that will take you places like the Bahamas, Jamaica, Thailand, Virgin Islands, and Italy. These are just a few of the thousands of beautiful places to choose from. Once you make the move to join this company, you will be able to experience any place in the world that you have an interest in. There is no way that you would not be able to enjoy the good life with Coastal Vacations, they see to it that you have wonderful experiences and a whole lot fun. Joining our Coastal Vacations Christian Team could be the best decision of your life. 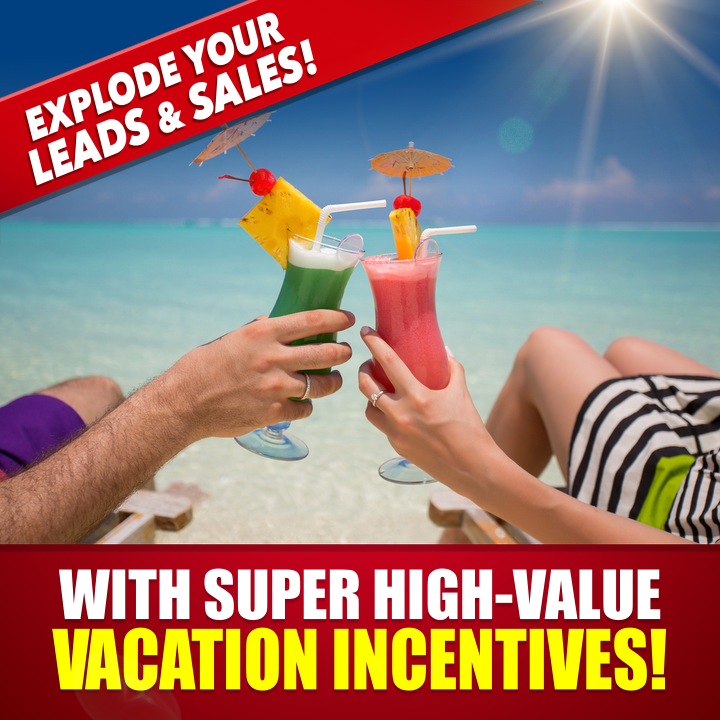 This is an outstanding company with excellent credentials that ensures your success not only in having an amazing income but guarantees you having fun along the way. 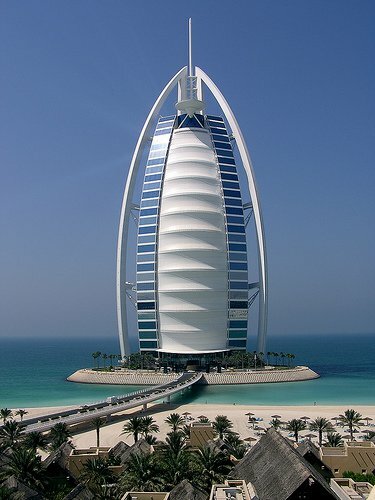 So, why not make a $10,000 + a month income and savor the beauty that the world has to offer. How could you go wrong with such a wonderful company? Join us and find out what the good life really is. .